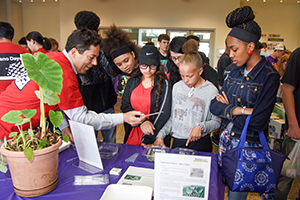 The College of Engineering hosted two outreach events in April in conjunction with the North Carolina Science Festival. The programs gave younger students a better understanding of scientific concepts and exposed them to life on campus. 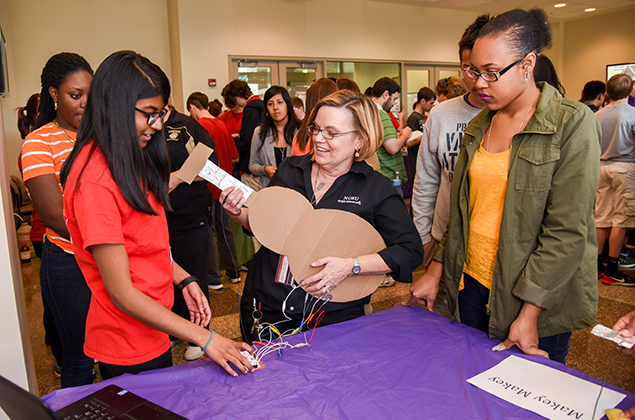 NanoDays is an annual statewide event coordinated by Dr. Gail Jones, Alumni Distinguished Graduate Professor in NC State’s College of Education and director of the Nanoscale Science Education Research Group. 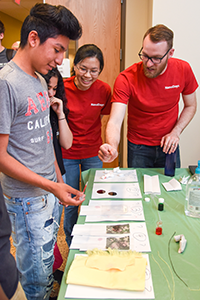 A Research Triangle Materials Research Science and Engineering Center (MRSEC) outreach event gave visitors a closer look at the center’s work with hands-on demonstrations and a presentation by an NC State chemical engineering professor. NanoDays, held the afternoon of April 20 in Engineering Building III on NC State’s Centennial Campus, combines fun hands-on activities with presentations on current nanotechnology research. A range of exciting programs demonstrate the special and unexpected properties found at the nanoscale, allow students to examine tools used by nanoscientists, showcase nano materials with spectacular promise and consider implications of new technologies for society. 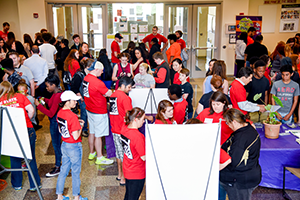 NanoDays began at NC State and is now a nationwide festival of educational programs. “Our goal is to introduce students to cutting-edge innovations that have been enabled through nanotechnology, to help students have an idea about future careers in nanotechnology, as well as the cutting edge research our engineers and scientists are doing,” said Jones. About 300 students were in attendance for the event, with a majority coming from Butner-Stem Middle School in Butner, Athens Drive High School in Raleigh and Mt. Pleasant High School in Mt. Pleasant. NanoDays experiments included memory wire that could be stretched without deformity and would return to its original shape once introduced to extreme heat, and the lotus effect, in which water droplets were repelled by nano fabric and could retain a liquid shape without being absorbed. Students created their own edible gummy worms using calcium chloride solution and a sodium alginate mixture. Toby Tung, IT and instrumentation manager in the Department of Materials Science and Engineering led the nano-ice cream experiment. In order to create this delicious frozen treat, liquid nitrogen was poured into a metal bowl and combined with half-and-half, sugar and vanilla extract. The mixture was then stirred continuously and eventually reached the consistency of real ice cream. 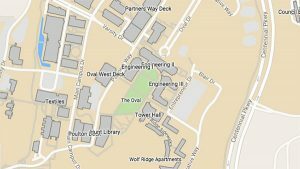 Later that evening, the Research Triangle MRSEC event was held in Engineering Building I. This event featured hands-on experiments such as the science of Jell-O, how gelation works and how proteases, using pineapple juice, can disrupt gelation, as well as a lesson on edible DNA that used multi-colored mini-marshmallows as base pairs to show students what DNA is and how it works. The event allowed elementary- and middle school-level students and their parents to have sufficient one-on-one contact with the demonstrators, so that they did not feel rushed or overwhelmed. Launched in September 2011, Research Triangle MRSEC is a national resource for materials science and engineering research and education that encompasses faculty members and students at NC State, Duke University, North Carolina Central University and the University of North Carolina-Chapel Hill. The featured headliner for the event was Dr. Bob Kelly, Alcoa Professor in the Department of Chemical and Biomolecular Engineering. Dr. Kelly’s lecture “Living on the Edge” focused on the science of hyperthermophiles. The presentation allowed everyone in attendance to gain a better understanding of thermophiles and Dr. Kelly took the time to ask the younger students questions that tested their own knowledge of the subject. Dr. Stefan Zauscher, Sternberg Family Professor of Mechanical Engineering and Materials Science at Duke University and director of the Research Triangle MRSEC, said events like these not only offer younger students a chance to learn more about science, but also give university students a chance to explain how this science works in a way that every audience can understand.